“How can you help me change all that?” she continued, but this time she wasn’t smiling. I knew I had to explain to her and give her a visual answer. She was someone who came from art so I looked for a metaphor that would fit her world. I wanted to talk to her in her own language. 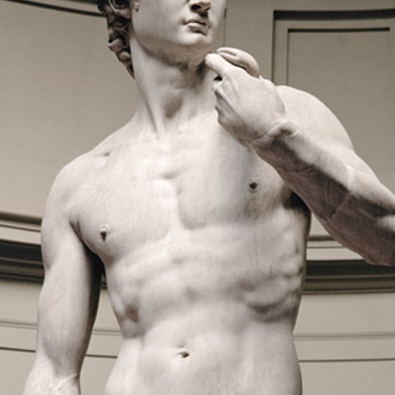 “Remember famous Michelangelo, who created these wonderful marble and delicate statues, like David?” I asked with a mischievous smile. “So I’ll tell you a story about him, and we’ll do what he did. Of course he was a genius, so we’ll just learn from him,” I continued. ” Michelangelo was used to order the largest blocks of marble for making his statues from a specific region in Italy,” I saw her big eyes looking at me like a child. The bright smile that spread in her eyes showed me I could explain to her the nature of our shared journey. And I clearly knew that the “statue” that hides in the “marble” is beautiful. Human beings have two strong needs that are essentially contradictory: The need to belong, to feel a part of something, the need for security, and a sense of routine that has a feeling of familiarity – and the need for innovation, excitement, searching for the unknown, breaking known boundaries and attraction to the what’s new. Nowadays, our world is turning into a place where most of the safest frameworks, including belonging to a family or a close group are disappearing. On one hand the world is more global, and at the same time becomes more alienating. Yet the independence – the freedom – to build whom you want to be is far greater. Human association and the groups that it creates have become larger, more diffuse, more anonymous and less physically close. The “Virtual” is supplanting the physical, and with it the need for security is increasing, as the drive for thrills becomes more intense. Everything appears to be possible, yet our basic psychological needs haven’t changed. The framework which bears the brunt of most of these conflicting ideals is the relationship. The expectation from the spouse (whether male or female – the gender differences are becoming more and more blurred) has developed into a catch-all: demanding emotional and physical safety, closeness, the warmth and sense of family. Yet, at the same time, the relationship is expected to be the source of novelty, thrill, even the fulfillment of fantasy. But paradoxically, passion thrives in an environment of mystery, adventure, and some degree of distance. That’s why the initial “infatuation period” is when passion is at its most powerful. The excitement, the novelty, not knowing the extent of the other’s commitment – and fantasy, idealization, the potential for alienation all increase desire and need for physical closeness. The sexual tension is then at its peak. With security, familiar routine, emotional intimacy and friendship – we feel more confident, less alienated, and we develop a sense of warmth and protection. But more often than not, this closeness and confidence directly offset and reduce passion and sexual desire. The daily routine, raising children, working, shopping – the very sense of security, belonging – all these familiar feelings aren’t the recipe for passion. Sometimes love remains there – without the passion. In earlier times, the “relationship” was not expected to deliver so many facets of human need, but now, the relationship must provide and contain both security and the passion, the dependable and the unknown. One person (spouse/partner) now has the task of providing these two conflicting needs, and doing so in a world that is itself becoming more alienating and, at the same time, addicted to thrills. This almost paradoxical load on the relationship, in the hectic pace of life today, is almost unbearable. So how is it possible to bridge the gap between these two conflicting needs? How can you be both “the best friend” and “the mysterious and desirable stranger” at the same time? Is that even possible? Or are we doomed to only fulfill one of the two and give up the other, which is just as essential? The answer is: Yes. It’s possible. This requires a certain skill, learning, attention, awareness and preparedness – and especially – some serious flexibility. Shared growth, yet with clear boundaries. Nurture the many shades of grey, steering clear of the inflexible, absolutes of black and white, they are deceptive: Not all which seems “committed” is “safe.” Not all the “unfamiliar” is indeed “foreign.” And with working on the relationship, of course, one should work on the connection to the self, to the individuality, define the borders, and to be as clear as possible of separation anxiety and narcissism. Two whole people, with clear boundaries, with mature souls and shared values – and who embrace the complex ideas of “vision” and “bravery” – can integrate these conflicting needs in relationships, finding a home for both comfort and passion over the years. Once we allow our individual borders to be blurred – our own understanding of our “self” to slip away – we cannot be the same “other” that our partner had once known, and been attracted to, both physically and emotionally. Is preserving both security and passion a challenge? Absolutely! But we all know that to acquire a particular skill (learn a language, improve physical condition, play an instrument), we need help in learning, and a teacher. But because the demands we make on our relationships have changed so much so quickly in our society, we’ve come to expect ourselves and our partner to somehow “just know” how to manage and integrate the complex balance of closeness and boundary without aid and support, and of course, without an existing model. And this leads to so much disappointment and failure. People blame the other or themselves, marching forward in search of “couple-hood,” with no support, guidance or assistance whatsoever – and so often without even imagining that such help truly exists. If you repeatedly come to the same place in relationships – always having to trade off passion for security, security for passion – I hope this has been given you some things to think about, some hope that things can change, and maybe a kick in the pants to do something about it. Everyone has the right to love and be loved. These two rights are actually one. Although in our society the search and focus is mainly on the right to be loved. The right to love and to give your love in our society of abundance, is limited mainly to the context of parents and children. Parental giving which is basically giving to one’s self (our children are our continuation) – is considered the “correct” giving. Needless to say that most parental giving in our society comes with an expectation of reciprocation: An expectation to be supported in old age, to be together during the holidays, expectation for grandchildren, and so on… There is no giving here, in the pure sense, that is not waiting for compensation. This is not giving for the joy of giving and the opportunity to love. Is not experienced nowadays as a right but as a burden. Even when it comes to a family member (Who is a part of self). We’ve forgotten what’s known to all emotionally educated people. To love and be loved is the same. These are two sides of the same coin. Same energy. Same right and joy and happiness. But with the development of ego, personal need, and the personal vision of all to succeed and be loved, we have lost our understanding of the gift of giving to others. People do not have time anymore for listening and giving. Listening now has become minimal. Real intimate communication is rare. People are waiting for the other to finish speaking so they can say their own. Many turn to professional help to get a sympathetic ear, because none is available for free. The more we love the other, the more we will automatically receive love – just by giving. This is the energy that comes back to us like a boomerang. It’s almost a physical law. So the more we love, and give in real joy from our hearts – the more love we receive in return. The right to love is a precious right that was given for free to all human beings. It is the same right as to be loved. I advise to practice the boomerang effect slowly and gradually. Not to shake the homeostasis of the habit of only receiving. Try to listen to someone every day. Then, give a compliment from your heart, express caring and also help physically. Practice the boomerang effect and the development of the ability to give and receive. Train this ability just like at the gym. Slowly, but steadily. Like any muscle, Love needs to be trained and developed.